It’s well known, the map service by Google much useful almost, and now it looks Apple is also entering in providing map service as Google and other services. 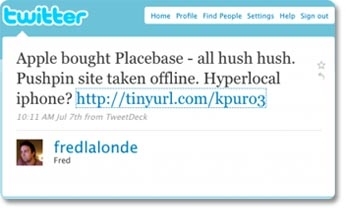 Nearly three months before founder of openplaces.org Fred Lalonde detailed about the Maps API in a tweet that Apple had bought the company that produced it. Openplaces uses software API called Pushpin made by the company Placebase (similar to Google Maps) and among no response from the company regarding this, makes clear, only this company what Apple bought? • offer a way to layer commercial and other data sets (such as demographics and crime data) onto the maps using an easy-to-use application programming interface (API). It all makes anxious, What Apple is to proceed with it?